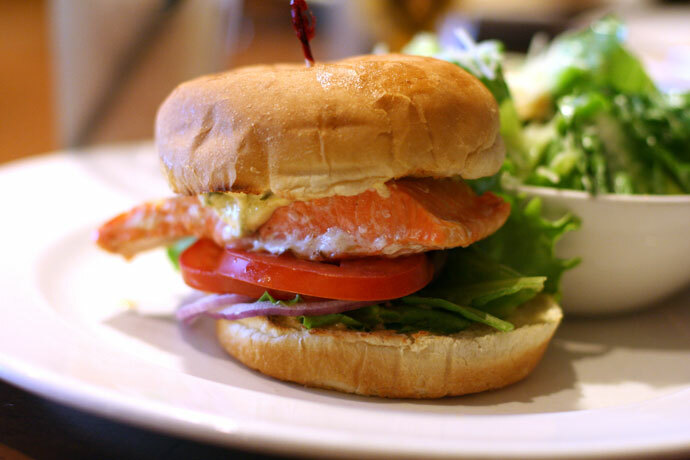 I made another visit to White Spot in downtown Vancouver (click here for location and more info), and enjoyed their Salmon Burger lunch special (pictured below), which was a reasonable $11.99 and came with a very large Caesar salad. This was some of the best food I’ve ever had at White Spot, and I gobbled it up so fast that I was finished much sooner than my coworkers. White Spot (web site) is a chain of restaurants that serves Canadian/American style food. This downtown location (80 West Georgia Street, Vancouver, BC, phone 604-662-3066) is really close to downtown theatres, the Granville St. Entertainment district, and BC Place Stadium (home of the BC Lions Football Team) as well as GM Place Stadium (home of the Vancouver Canucks). View Part 1 for more info and another photo from White Spot. 8,584 views. This entry was posted on Friday, June 13th, 2008 at 11:53 pm	and is filed under Affordable, American, Asian, Breakfast, Brunch, Burgers, Business District, Casual, Chain Restaurants, Chicken, Downtown, Family, Food Photos, GM Place Stadium, Granville Street, Hamburgers, Healthy Food, Large Portions, Lunch, Lunch Specials, Pasta, Reasonably Priced, Restaurant, Sandwiches, Vancouver, Vancouver Restaurants. You can follow any responses to this entry through the RSS 2.0 feed. You can skip to the end and leave a response. Pinging is currently not allowed.